Cadiz passenger and car ferry ticket prices, timetables, ticket reservations and information for ferries sailing from Cadiz to Arrecife, Las Palmas de Gran Canaria, Sta Cruz de la Palma and Sta Cruz de Tenerife. Compare all available Cadiz ferry ticket prices in real time and book the cheapest available Cadiz car and passenger ferry tickets sailing to and from Cadiz, Arrecife, Las Palmas de Gran Canaria, Sta Cruz de la Palma and Sta Cruz de Tenerife with Acciona Ferries ferries online with instant confirmation. Book Cadiz Ferry Tickets with Acciona Ferries for ferries sailing from Cadiz to Arrecife, Las Palmas de Gran Canaria, Sta Cruz de la Palma and Sta Cruz de Tenerife online in advance to enjoy the cheapest available ferry ticket price. The price you see is the price you pay. There are no hidden extras or surprises such as added fuel surcharges or booking fees and we do not charge you anything extra for paying with a Visa Electron card. The price we quote you for your selected Cadiz passenger or car ferry ticket, onboard accommodation and vehicle type is all you will pay, and that's a promise. To obtain a Cadiz ferry ticket price and book your ferry ticket securely online please use the real time ferry booking form on the left. You are also able to add a hotel at your destination, or anywhere else, to your ferry ticket when completing your ferry ticket reservation. Cadiz is the capital of the Cadiz Province in the Andalucia region of Spain and is the oldest city in western Europe with records suggesting that the city was occupied more than 3,000 years ago. Cadiz province has some of Andalucia's most windswept beaches, prettiest white villages and most celebrated sherry. It also boasts one of the region's most visited protected areas and the rainiest place in Spain: the Sierra de Grazalema Natural Park. Cadiz, Spain is a thoroughly enchanting city; even during these modern times, it has still managed to retain its sense of history, character and authenticity. Come to Cadiz, Spain and get to know this historic city, its sights, its sounds and its people. Today, the Cadiz coast is a mecca for windsurfers, birdwatchers and anyone who prefers a wilder shoreline with relatively few beachgoers compared to the busier Costa del Sol. The historic centre of Cadiz has an island feel about its streets, lined with centuries-old seafront houses that have been weather beaten by ocean spray. Situated on a peninsula, this part of the city is almost completely enveloped by the sea; the town's beach is easily accessible and a mere pebble's throw from the centre. The skyline is dominated by the cathedral's gilded cupola that appears to shimmer in the incandescent light reflected by the sea. If you penetrate the honeycomb of narrow streets behind the cathedral, you come across small, pretty squares and pavement bars, which serve up some of Andalucia's tastiest seafood treats. If you're here in February, don't miss the incredible carnival, the biggest in mainland Spain. The city’s high and thick walls, gardens and towers provide a picturesque view as seen from the sea. Its honeycomb of narrow cobble-stoned streets, alleys and squares shows it to be a typical Andalusian city. There are highly fascinating historical and cultural monuments - churches, towers, museums - all close to the blue waters of the Bay of Cadiz. Cadiz offers a highly interesting mixture of history, culture, architecture and landscape. The Historical Quarter is particularly beautiful, with an old world charm. The different barrios (Spanish quarters) play a strong part in giving the Historical Quarter its distinctive personality and flavor. There is the El Populo district, which is originally an old medieval village, La Viña, a fishing district, and the Santa Maria quarter – which is where you will find flamenco singing at its best. When exploring the Historical Quarter, be sure not to miss the Baroque Cathedral- a majestic structure with an impressive golden dome. There are museums with impressive art and archeological collections, such as the the Municipal History Museum, the Fine Arts Museum and the Archeological Museum. There are also churches, beaches and parks for you to explore. The quaint and pretty plazas are perfect places to sit and relax, while sipping a nice hot cup of coffee. The squares have their own distinct style, such as the San Juan de Dios, the España, Mina, Consituction and Mentidero. These streets and plazas are lined by trees, said to be brought back by Columbus. All in all, Cadiz is a perfect place to meander along and discover the treasures it has to offer. Cross the Puerta Tierra, the gateway of the remains of the city hall, and you enter into a more modern atmosphere. While the Old Quarter is formed by plazas and narrow streets, the newer area of the city has high rises and wider avenues. Gaditanos, as the locals are called, are fun-loving. They love to party – and how! The Cadiz Carnival is probably one of the most exciting and colorful events in the region. People in bright costumes flock the streets. Singing, dancing and general revelry can be found everywhere. Today, unlike most other ports of its size Cadiz seems immediately relaxed and easy going, not at all threatening, even at night. Perhaps this is due to its reassuring shape and size, the presence of the sea making it impossible to get lost for more than a few blocks. It also owes much to the town's tradition of liberalism and tolerance which was maintained all through the years of Franco's dictatorship, despite this being one of the first cities to fall to his forces and was the port through which the Republican armies launched their invasion. Best Price Guarantee - We always offer you our lowest available Acciona Ferries passenger and car ferries ticket price to and from Cadiz. There are no hidden extras or surprises such as added fuel surcharges or booking fees and we also we do not charge you anything extra for paying with a Visa Electron card. The price we quote for your selected Cadiz ferry ticket, onboard accommodation and vehicle type is all you will pay, and that's a promise! In the unlikely event you find the same all inclusive Cadiz ferry ticket cheaper in the brochure of any other tour operator we promise that we will do our best to beat that price or offer you the choice of requesting a refund. 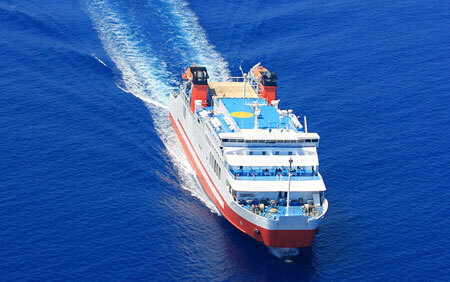 To book Cadiz car and passenger ferry tickets please click here. At ferryto.co.uk you are able to obtain live Cadiz ferry ticket prices, check availability and book car and passenger ferry tickets to and from Cadiz at our lowest available ticket price. Ferryto.co.uk is part of the world's largest online ferry ticket distribution network providing the ability to book over 80 major European ferry operators including to Cadiz and to over 1,200 other ferry routes throughout the UK, France, Spain, Ireland, Holland, Eastern Europe, the Mediterranean, the Baltic and North Africa.